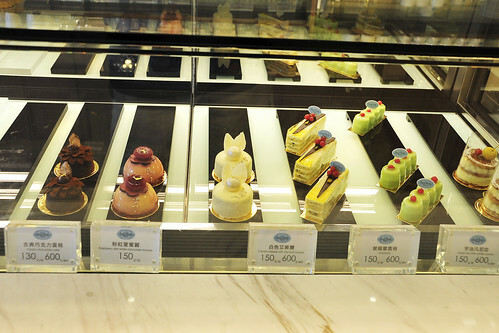 Before our trip, we’d made a list of the patisseries to visit during our short 2-day-1-night stay in Taichung. However, the already modestly crafted list had to be trimmed down further to accomodate for night markets, not to mention a trip dedicated to hunt for our favorite 阿明师太阳饼, whose flavours and aroma we cannot forget since our very first 邂逅 enounter years back. After depositing our luggage at our hotel located just a stone’s throw away from Fengjia Night Market, we made a beeline for Agio Chocolates, one of the several patisseries on the target list for our short stay in Taichung. Incidentally, it was also the closest to our hotel, or so we thought! As we were making our way to there, we chanced upon yet another patisserie which had escaped our “research” (which is admittedly not thorough enough apparently!). 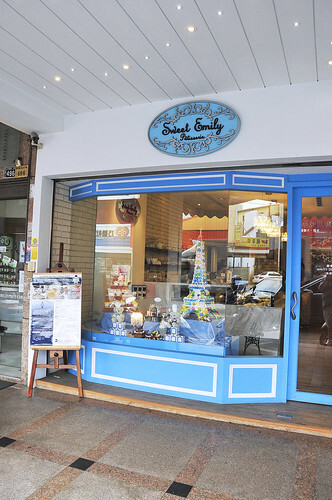 Pâtisserie Sweet Emily located just two streets away from where we were putting up at for the night had just opened for barely a couple of months prior to our trip and thus had not been widely reviewed and blogged about by the Taiwanese foodies. No wonder this place escaped radar detection! Nonetheless, I’m glad that we’d chanced upon this place! After a quick glance into the shop, we’d decided come back again en route our way back to the hotel, since visiting Agio Chocolates is really a priority. Read about the upcoming post on our visit to Agio and you’d know why! 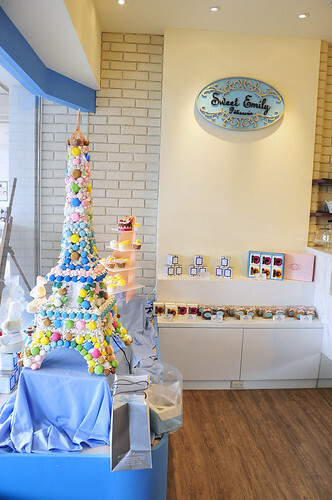 The first thing that captured our attention is surely the beautfiully crafted macaron croquembouche in the shape of Eiffel Tower, a sure sign of a French confectionery! 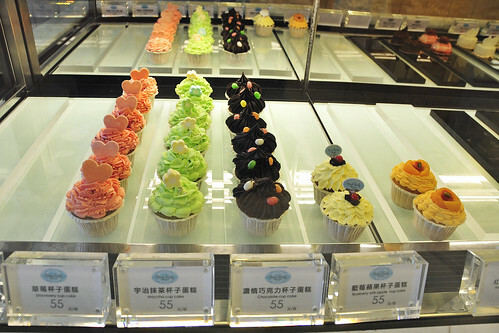 Cupcake fever in Taiwan as well! 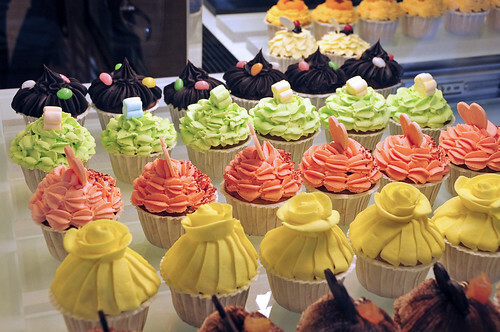 And yet more cupcakes! Apparently very popular amongst the folks from the nearby Fengjia University! Selection of cookies and other petit four secs. They also carry a range of tea from Le Cordon Bleu. 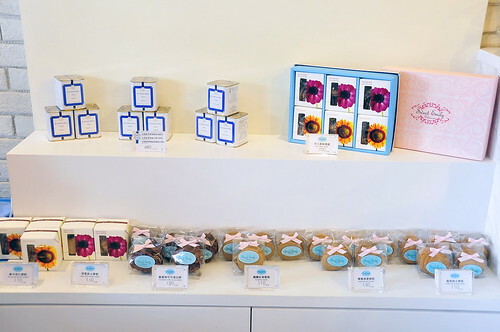 Patisserie Sweet Emily has some kind of collaboration with LCB on an internship program for their graduates. Always ready to nurture young pastry chefs to come! Second floor is dine-in seating areawhich we did not visit since we opted for takeaway. 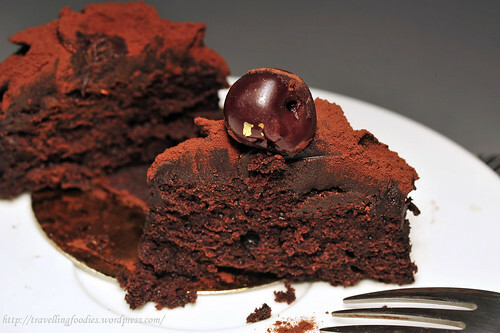 Classic Chocolate Cake, 古典巧克力蛋糕 the only all-chocolate piece in their spread. Despite being the cheapest item on the cake menu (NT 130), it is by no means impoverish in its making. 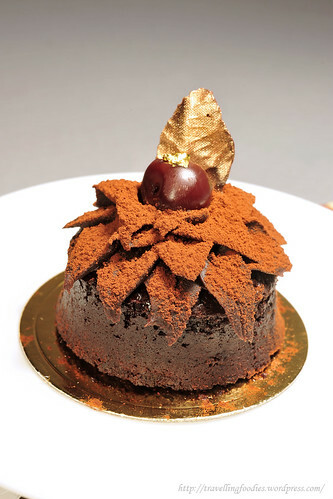 Dense chocolate cake, a cross between an american brownie and a french moelleux au chocolat as the base, embellished by chocolate decor styled as petals, together with a single griotte speckled with gold foil, before a generous dusting of cocoa powder. 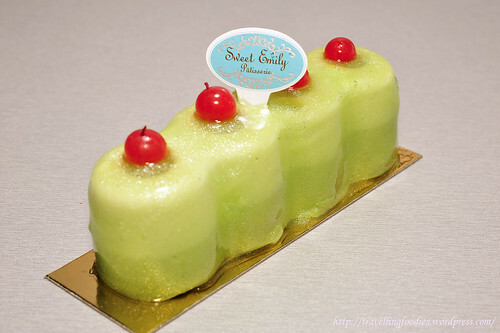 For contrast, we ordered Green Tea Vanilla Mousse 宇治凡尼拉. 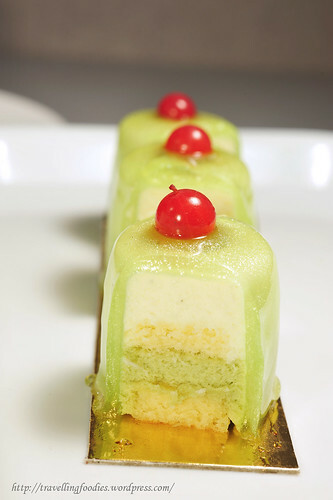 Built up from layers of vanilla and matcha sponge, followed by a thick slab of vanilla mousse before being robed with a matcha glaze in funky lime green, embellished with redcurrants. Clearly this piece was out to astound and impress visually, employing shocking juxtaposition of colors. However, I wish I could say the same for the flavour profile. Despite being two very commonly used flavours, matcha and vanilla are seldom married together and for good reason. They are “similar” somewhat and thus a clear lacking in contrast. The flavours do not standout on their own when put together and were, put politely, very very mild. This is easily one of the most boring pieces I’d had in quite a while, bearing true testament to an old saying that “clearly looks aint everything”. I wish more could be said about this piece but regrettably, no. oh yeah, the inclusion of redcurrants was, simply put, totally bizarre, which apart from being a visual enticement, added no merit to the piece. Would I try out their cakes again? Yes if I have a chance to do so in future. 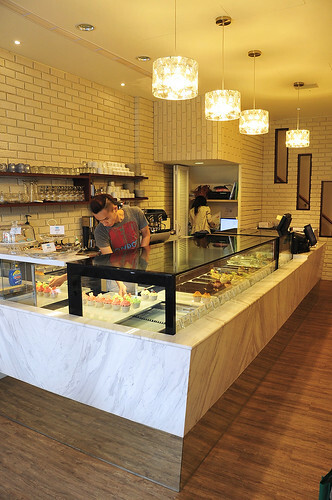 Being a relatively new establishment, I reckon that it is still in the process of finding bearings in Taichung’s local pastry scene. So a generous degree of experimentation and errors is only to be expected. 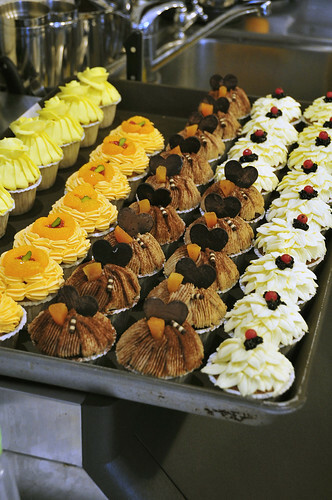 Their work most certainly did exhibit a certain level of proficiency in pastry-making. 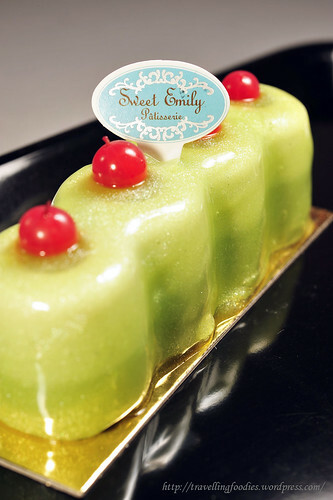 As such, I am looking forward to seeing Pâtisserie Sweet Emily better themselves and refine certain areas of their craft, especially in terms of flavour sophistication and profiling. This entry was posted on September 24, 2012 by Alan (travellingfoodies). It was filed under Food, Travel and was tagged with classic chocolate cake, cupcake, french pastry, matcha, Patisserie Sweet Emily, taichung, Taiwan May 2011, Vanilla Matcha, vanilla mousse, 台中. 台湾.